Truth is, way too many knowledge bases end up being like the left out kid from gym class where customers completely stop using them! The question is: Why exactly? Out of all the countless encounters with knowledge bases, our team and I have managed to compile the main points for why knowledge bases fail. This is obviously the last thing you’d want happening to your KB – so let’s explore the reasons behind it! If 80% of people take a peek inside your knowledge base and instantly jump out of the cold water – you know that you’ve messed up big time in terms of how useful your KB really is. No matter the brand name, product or reputation – you already know that if the relevance of the knowledge base is bad, there will be nothing in the world to convince you to use it! These two reasons are probably the main warning signs that your KB is falling out of touch . . . This is sadly true. There are a surprising amount of common questions that simply never get dealt with within a knowledge base and the worst part is – it’s not even hard to figure these things out! Using Analytics to find out what users search for. Asking your support reps what the most general/common questions are being asked. This information will do the #1 most important thing for you: It will tell you what you need to write about next. As your product grows and improves – many things that you have said or mentioned in your earlier content will no longer be valid. This is why keeping your content up to date is crucial as the company (and especially the product) grows. 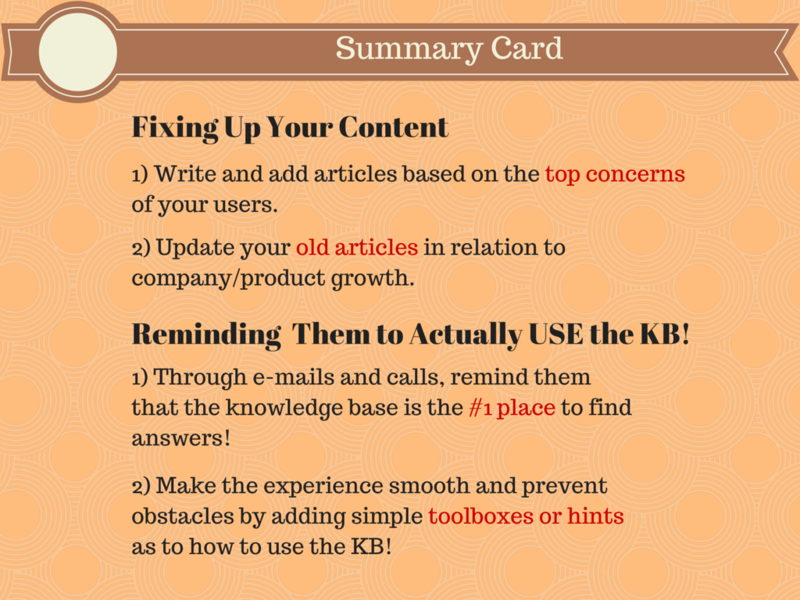 By updating your KB and creating new content based on the most popular requests/questions/concerns, you will essentially keep the base warm and comfortable at all times without a shred of distrust from your users! However, none of this matters if the next point is missing. Your content might be the bomb, but what if nobody is reading it? Most probably, you’re not insisting with the knowledge base. Simply having good content chilling in the sun waiting to get served isn’t enough. Usually, people are simply used to sending a ticket, e-mail or calling support. They might not be used to actually use a knowledge base. This is why a KB must be constantly enforced and labeled as the #1 place to go for information and answers! For every ticket, e-mail or ‘thank you’ that you decide to shoot off to a user – consider adding a small “Hey by the way, if you’re ever looking for similar answers, you can check out -this section- of our knowledge base to get a smoother and faster response to what your concern was!”. Meaning that even if they send you an e-mail the first time – the chances of it happening again are significantly lower. Customers Won’t Use What They Don’t Understand: Here’s How You Can Help Them Swim! Imagine having a function on the site that rarely anybody ever uses. Why is that? What causes this passive behavior? Maybe the idea of the function simply is too ambiguous or unclear to the user. Putting yourself in the mentality of the user and predicting where they might go wrong will give you a huge strategic advantage, as you’ll have the option to fix it before the problem even occurs. For example, you might add a small instruction bar right next to the button or a ‘hover box’ that appears that tells you what the point of the function is and how you use it. Implementing these tools will essentially eliminate all sorts of “Oh come on, what’s this thing now?” kinds of responses from your users and could potentially encourage them to use it more often! PS: How would YOU keep your KB freshly served and used at all times? Ideas are always welcome, so share them below!